When you're trying to eat meatless, black bean burgers are a great choice! The burgers were very quick to throw together, especially since I had some of my favorite french bread rolls in the freezer. The oven fries were a little complicated and annoying (what with the soaking, the flipping, and a little sticking to the pan) but once I tasted one, I knew all the effort was totally worth it. They were so good! 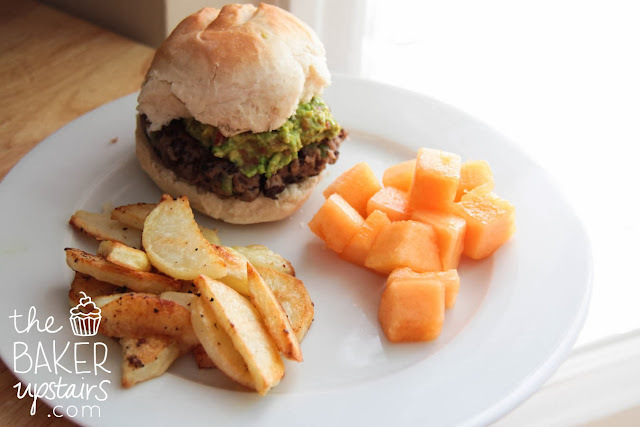 We topped our burgers with some fresh guacamole, and with canteloupe on the side it was a perfect summer meal! Place a medium skillet over medium-high heat. Combine the panko with 2 teaspoons of the olive oil and mix with a fork to blend. Add the mixture to the skillet and toast the panko, stirring frequently, until light golden brown. Remove from the heat and let cool to room temperature. Place 2½ cups of the beans in a large bowl and mash with a potato masher or a fork until mostly smooth. In a separate bowl, combine the eggs, 1 tablespoon of the oil, cumin, salt and cayenne. Whisk to blend. Add the egg mixture, toasted panko, the remaining ½ cup beans, bell pepper, cilantro and shallot to the bowl with the mashed beans. Stir together until evenly combined. Divide the mixture into 6 equal portions, about ½ cup each. Lightly pack into 1-inch thick patties. (At this point the patties can be covered tightly with plastic wrap and refrigerated for up to 24 hours before cooking.) Heat 1 tablespoon of the oil in a large skillet over medium heat until shimmering. Carefully lay half of the patties in the skillet and cook until well browned on both sides, about 8-10 minutes total. Transfer the cooked burgers to a plate, tent with foil, and repeat with the remaining oil and bean patties. Serve warm. Drain the potatoes. Spread the wedges out on layers of paper towels or on clean kitchen towels. Pat dry with additional towels. Wipe out the now empty bowl so it is dry. Return the potatoes to the bowl and toss with the remaining 1 tablespoon of oil. Arrange the potato wedges on the prepared baking sheet in a single layer. Cover tightly with foil and bake for 5 minutes. Remove the foil and continue to bake until the bottoms of the potatoes are spotty golden brown, 15-20 minutes, rotating the baking sheet after 10 minutes. Using a metal spatula and tongs, flip each potato wedge keeping them in a single layer. Continue baking until the fries are golden and crisp, 5 -15 minutes. Rotate the pan as needed to ensure even browning. When the fries are finished baking, transfer to a paper-towel lined plate to drain some of the grease. Season with additional salt and pepper to taste. Serve warm.